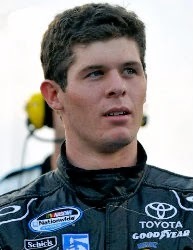 Ryan Truex, the 2009 and 2010 NASCAR K&N Pro Series East Champion, will run a full-time NASCAR Camping World Truck Series schedule for Hattori Racing Enterprises in 2017, driving the No. 16 Toyota Tundra. Truex competed in 15 events with HRE in 2016, bringing home a career-best finish of second at Daytona International Speedway in February. Scott Zipadelli will take over the crew chief duties for Truex in 2017, his first season with HRE. In 2016, Zipadelli picked up his first-career NCWTS victory in August at Michigan International Speedway. The veteran crew chief also has three NASCAR Xfinity Series victories on his resume. Truex made his HRE debut at Daytona last year and competed in select events throughout the 2016 season. In 15 starts the 24-year-old compiled one Top-5 and four Top-10 finishes. Truex has three career NCWTS starts at Daytona, with two Top-5 results. There will be several sponsor announcements coming at a later date. Martinsville Speedway powered-up four of the track’s new LED light towers Wednesday night, for the first time. The lights, located along the backstretch of the half-mile track, gave engineers and track staff the first glimpse of what the “Light Up Martinsville” project will look like when complete. Campbell said there is no more fitting way to celebrate the track’s 70th anniversary than by looking to the future. Racing returns to Martinsville Speedway March 31-April 2. The weekend starts on Friday with Virginia Lottery Pole Day and continues Saturday with the Alpha Energy Solutions 250 NASCAR Camping World Truck Series Race. The Monster Energy NASCAR Cup Series will be in action on Sunday with the running of the STP 500. Motor Racing Network -- “The Voice of NASCAR” – has been honored by the National Motorsports Press Association with 26 awards in 13 categories for broadcast excellence during the 2016 season, including first place in the Live Event Broadcast category for the fourth year in a row. NASCAR is set to shuffle its competitive cards in a big way later today, announcing a series of sweeping format changes for all three of its national series. Beginning next month at Daytona International Speedway, Camping World Truck, Xfinity and Monster Energy Cup Series races are expected to be divided into three distinct segments, with planned stoppages in between. The opening two stages of each event will comprise 25-30% of the race total, with the final stage accounting for 40-50%. Each stage will pay championship points to the Top-10 finishers in descending order (10, 9, 8, etc.) with stage winners receiving a single bonus point for seeding at the start of the post-season playoffs. Monday’s announcement will be controversial in some corners, with fans bemoaning the latest in a series of changes made to the sport in recent seasons. Ironically, the sanctioning says the changes were spurred by suggestions from that very fan base; an ever-changing group that seems to want more action, fewer lulls and a more compact product. Today’s announcement will be a clear attempt by NASCAR to inject some excitement back into the first half of its events. For far too long, the sanctioning body has been dogged by complaints of “boring” races, with fans tuning in for the green flag, then wandering away – often for hours at a time -- to cut the grass, shop for groceries or tend the barbeque; confident that they won’t miss much. More and more these days, they’re right. In modern-day NASCAR, engine failures have become virtually non-existent. Cars don’t erupt in plumes of white smoke anymore, spilling fluid on the track while being chased down the backstretch by their own connecting rods. Mechanical failures of all kinds are down dramatically, with a vast majority of the 40-car starting field still on-track at the drop of the checkered flag. Tire technology has improved, leading to fewer blow-out related crashes. An increased dependence on aerodynamic downforce keeps cars glued to the race track like never before, resulting in fewer spins and crashes. Fewer caution flags means fewer pit stops, fewer restarts and less excitement; a trend that NASCAR cannot afford to ignore any longer. Awarding 10 points to segment winners will incentivize drivers to go the front immediately and stay there, all day long. No more “riding in the pack,” no more “saving your car” for a points-paying finish that is still hours away. Modern-day NASCAR fans want action now instead of excitement deferred, and Monday’s announcement should deliver that, in spades. Today’s announcement will be a difficult pill to swallow for many NASCAR fans. Personally, I am uneasy about a system that could – at least in theory – award the 2017 championship based on a driver’s ability to win the Daytona 200, 300 or 400. I’m a traditionalist, and appreciate the endurance aspect of our sport. I’m willing to sit through the occasional mid-race competitive lull, knowing that business usually picks up at closing time. But I’m in the minority, and I know it. For every fan like me, there are a dozen who say they doze off during those mid-race lapses, lulled into a competitive coma by a sport that has contented itself for far too long with the idea of a dominant leader, cruising along with an eight-second lead, lap after lap after lap. Is NASCAR’s new format manipulative? Perhaps. But there are worse things to be called than "manipulative." NASCAR cannot continue to be the sport you sleep through. With races routinely requiring more than three hours to complete, NASCAR has become a marathon event in a microwave society. That trend cannot be allowed to continue any longer. There is too much on the line. We cannot expect a fan base increasingly raised on thrill-a-minute video games to sit and wait – often for hours at a time – for their final-lap payoff. It was time to add some spice to the soup, before we lose another generation of fans. JR Motorsports announced today that Liberty University will sponsor William Byron in the NASCAR Xfinity Series in 2017. Byron, who unveiled the No. 9 Liberty University Chevrolet Camaro during a Facebook Live stream, will drive the car in 17 of 33 events this season, beginning with the season-opener at Daytona International Speedway. Byron, a native of Charlotte, N.C., is coming off a rookie season in the NASCAR Camping World Truck Series where he posted a rookie-record seven wins, 11 Top-5 and 16 Top-10 finishes. 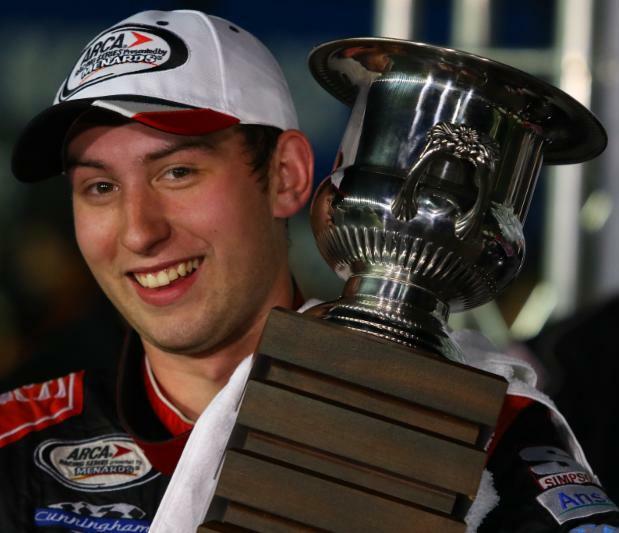 The 19-year-old also claimed Rookie of the Year honors and qualified for the inaugural NCWTS Chase. Founded in 1971, Liberty University is distinguished as the largest university in Virginia, and the largest Christian university in the world. 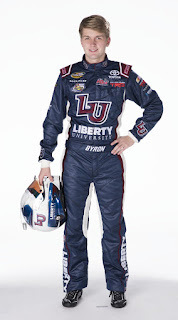 Liberty University was a previous partner with JRM during Byron’s Late Model career with the team in 2014 and 2015. Along with the sponsorship news, it was also announced Dave Elenz will serve as crew chief for Byron and the No. 9 Liberty University team in 2017. Elenz, a 35-year-old native of Gaylord, Mich., transitions from a two-year stint as crew chief of JRM’s No. 88 entry. He guided the team to four victories with drivers Dale Earnhardt Jr., Chase Elliott and Kevin Harvick. “It’s a privilege to have Liberty University on board with us in 2017,” said Byron, a Liberty University freshman taking online classes. “I’ve been honored to have had them as a partner the last few years, and I’m excited to take them into the NASCAR Xfinity Series this season. 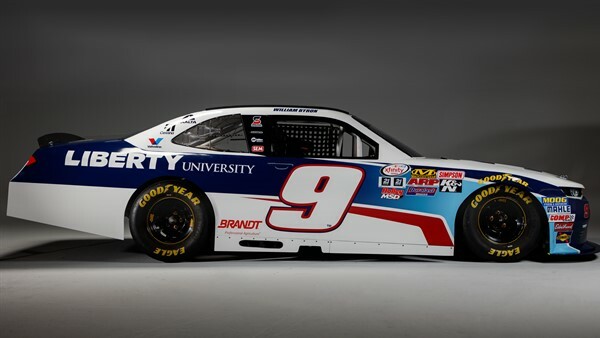 A schedule of the 2017 races with Liberty University as primary sponsor will be announced at a later date, as will additional partners for Byron and the No. 9 team. Apart from its primary races, Liberty University will receive associate placement in the remaining 16 events. Ford Performance announced last week that it is formally initiating a multi-tiered NASCAR driver development program. The first stage of that program will be a formal relationship with Brad Keselowski Racing and its NASCAR Camping World Truck Series effort, where Ford has signed Chase Briscoe as one of the drivers for BKR for the 2017 season. "We're making a commitment to win long-term in NASCAR," said Dave Pericak, global director of Ford Performance. "We have been increasing our engineering support and our technological development at the team level, and now we're looking to work with our teams to find the best available drivers coming up in the sport." The BKR effort, as well as other to-be-announced driver development efforts at different levels, will develop talent for all Ford teams in NASCAR. Current teams will be consulted as part of the selection process, but drivers in the program will have contractual obligations to Ford. In addition to their role within the NCWTS race program and related marketing efforts, drivers in the new Ford program will also assist the company as test drivers within the Ford product development program. "Starting this program with BKR makes sense since it has made a significant investment in its NASCAR Camping World Truck Series operation and it is reflected in its success on the track," said Pericak. "As we at Ford look to develop new winning drivers for, ultimately, our Cup Series teams, the BKR model is a proven step in that ladder. We are enthusiastic about the role BKR will play in our efforts and we look forward to working very closely with the team in driver selection, engineering, and other mission critical areas." "This is a big day in the history of BKR," said Keselowski. "To be recognized as a true partner to Ford and Ford Performance and what they are trying to do speaks directly to the hard work our team has put in over the last several years. It is an honor, frankly, and it is really what BKR is all about - providing young, talented drivers with championship-caliber equipment to continue to hone their craft and showcase their talents. We have been fortunate to have had a lot of success together with Ford across the three major NASCAR touring series and to now elevate that relationship in an official capacity is a testament to what we set out to do." 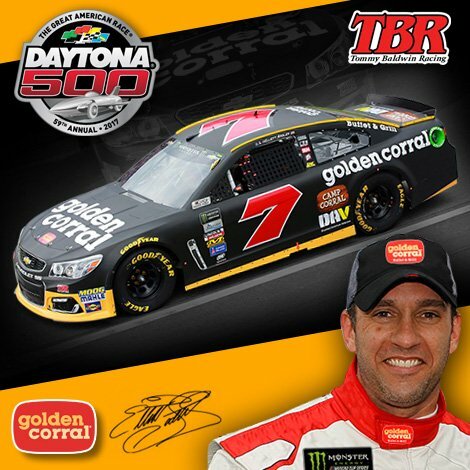 Tommy Baldwin Racing will compete in the 59th running of the Daytona 500 with Elliott Sadler behind the wheel of the No.7 Golden Corral Chevrolet. Sadler, a 16-year veteran of the Monster Energy NASCAR Cup Series, will do double-duty in NASCAR's opening weekend, competing in both the Cup and Xfinity Series. The Emporia, VA native and Baldwin have a relationship dating back to their days at Robert Yates Racing when Baldwin served as crew chief for Sadler. 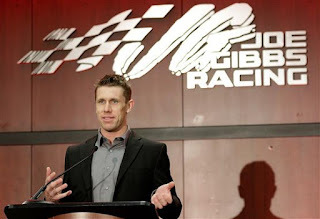 "This is a great opportunity for me and everyone affiliated with Tommy Baldwin Racing," said Sadler. 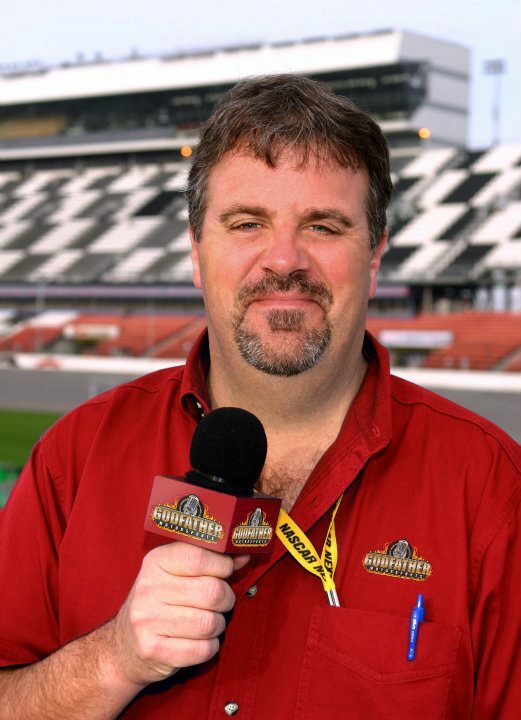 "I love the Daytona 500 and to have Tommy and Golden Corral offer me this opportunity is awesome. Tommy and I have known each other a long time. We actually won a qualifying race for the Daytona 500 together back in 2006. We're going to rekindle some of that magic and work our tails off to get our car in the race. I know Tommy is putting a lot of effort into this and we're going to go out and get the best result we possibly can for him and TBR's partners." Golden Corral returns for their seventh season together and will bring back their popular 'Top 10 Kids Eat Free' promotion. If Elliott Sadler finishes in the top-10 at Daytona, kids 10 and under will eat free at Golden Corral restaurants nationwide on Monday, February 27th. 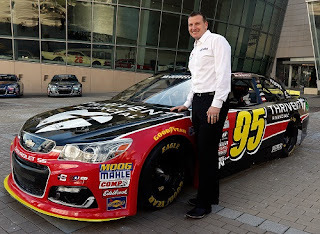 "We are excited to be working with Tommy Baldwin Racing for the seventh season," said Shelley Wolford, Vice President of National Marketing and Media at Golden Corral. "We will be cheering Elliott on to qualify at Daytona and then race for a Top 10 Kids Eat Free finish." "We look forward to having Elliott join TBR and Golden Corral for the upcoming Daytona 500," said team owner Tommy Baldwin. "Elliott has always been a strong restrictor plate racer which makes this a great opportunity for everyone involved. We know our fans look forward to the 'Top10 Kids Eat Free' promotion every year so we want to capitalize on that and finish the Daytona 500 strong." 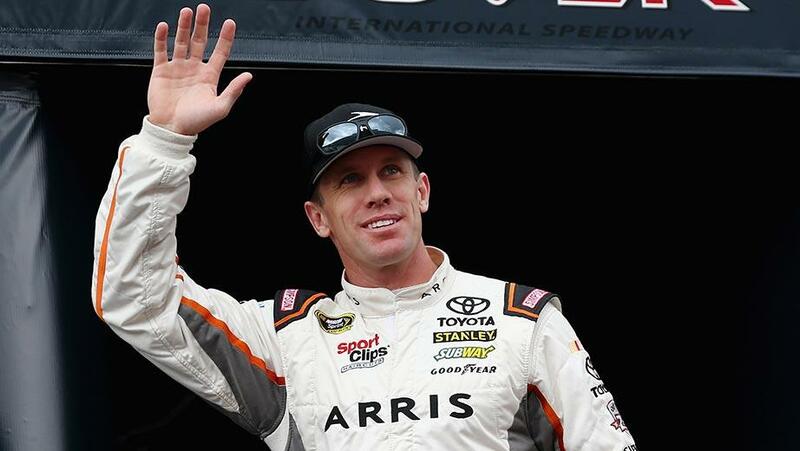 Carl Edwards walked away today, calling a halt to his 13-year run as an elite competitor at the very highest level of the sport. “I’m stepping away from full-time driving in the Cup Series,” he said. “I don’t have any intention of going back to full-time racing. I want to spend time outside the sport on things that are important for me. Edwards’ decision caught virtually everyone by surprise. 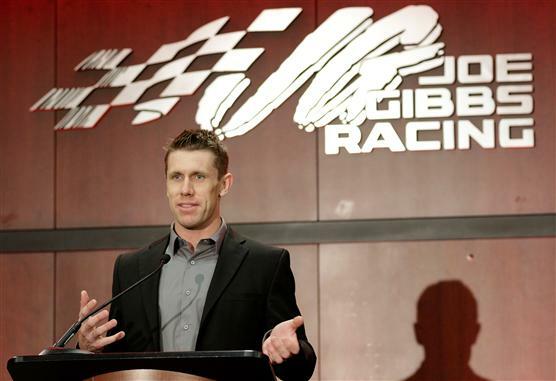 Just weeks after a late-race crash ended his bid for the 2016 Sprint Cup Series championship at Homestead Miami Speedway, the Joe Gibbs Racing driver appeared set for one of the most competitive seasons of his career. He had the talent, equipment, sponsorship and manufacturer support in place to finally grab NASCAR’s brass ring, but instead chose to not even make the attempt. That decision is baffling to some, especially after admitting that he is walking away from the sport without so much as a backup plan. For those who don’t know Edwards, that decision seems unfathomable. But for those who have shared space with him in the NASCAR garage, it makes perfect sense. "I believe it's the right thing." Edwards listed three major factors in his decision to step away; satisfaction with his career, the opportunity to spend more time with his family and a desire to step away from the sport while still healthy. “This was such a surprise," said team owner Joe Gibbs. "I was all set for the holidays, to have a little R&R. When he sat down and shared (his plans), I was totally surprised. It was nothing about contracts… it was about something Carl felt was important. “It was clear in our conversations with Carl that he had given this careful consideration and believes strongly that it is the direction he needs to go,” said Gibbs. “We support him in that. We loved having him be part of our team the past two years and we will miss him. But we hope he is happy in whatever is next for his life." Gibbs added that he has offered Edwards an opportunity to remain involved with both the organization and the sport, but gave no indication of whether he will elect to do so. Edwards made it clear, however, that there is currently no “next step” on his competitive radar. There is no new race team, no manufacturer offering a lucrative position as either a driver or team owner, no looming television deal. Just a realization that the time has come to apply the brakes, pull into the garage and go home. "If I am going to get back in a race car, I'm calling Coach Gibbs first," said Edwards. "There is no better race team." Edwards said he is satisfied with his NASCAR career, and he should be. His resume lacks nothing other than a Cup Series title, and he is a 28-time winner at the sport’s highest level, with 38 Xfinity Series victories and six more in the Camping World Trucks. Combined with a 2007 Xfinity Series championship, the only driver in the history of the sport to lose a Cup Series crown in a tiebreaker (to Tony Stewart in 2011) is a solid bet for NASCAR Hall Of Fame status one day. Edwards admitted that a major factor in his decision to walk away was the ability to do so with his health intact. Through 750 starts in NASCAR’s three national series, he never missed a race due to injury. His fanatical devotion to physical fitness made him a cover model for men’s health magazines, but no workout regime guarantees continued good health in a sport that lives at 200 mph. Edwards’ career wasn’t always smooth sailing. Stock car racing is an emotional sport, and the Columbia, Missouri, native raced – every day, every lap -- with his heart on his sleeve and a take-no-prisoners game plan; an approach that occasionally left him crossways with competitors and teammates alike. In March of 2010, a year-long feud with Brad Keselowski ended with Keselowski’s car hurtling upside-down into the catch fence at Atlanta Motor Speedway at nearly 190 mph; a horrifying crash exacerbated when television footage showed Edwards’ white-gloved hands turning sharply to the right, and into Keselowski’s rear quarter panel. 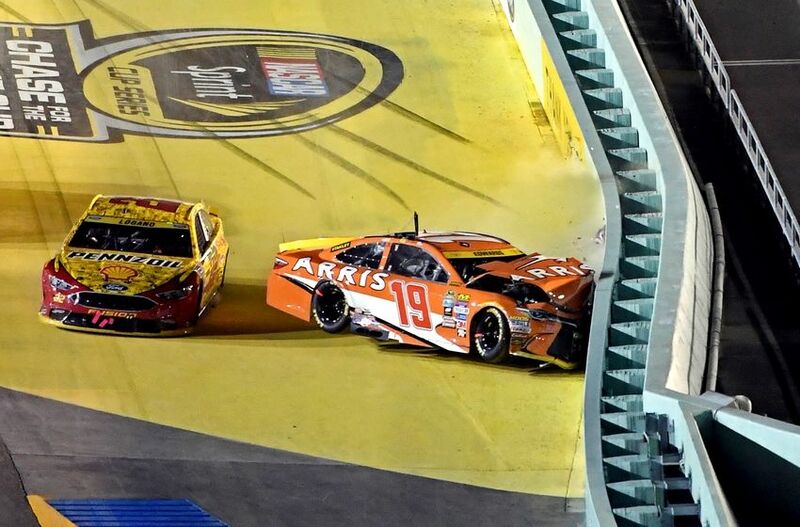 Edwards said he never meant to trigger such a horrific crash, and he and Keselowski eventually mended their fences. It is perhaps fitting that our final memory of Edwards is from the moments immediately following last season’s Homestead Miami crash. 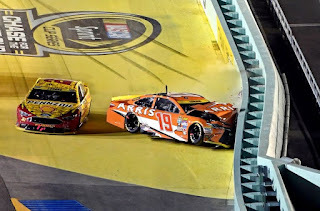 After attempting to block a surging Joey Logano on a decisive restart with just 10 laps remaining, Edwards pounded the inside retaining wall, destroying both his Arris Toyota and his championship dream, in one fell swoop. Most competitors would have reacted angrily, pointing an accusatory finger at Logano and bemoaning an unfair and unwarranted end to their season. Edwards, however, took the opposite approach, climbing from his battered machine and walking toward Logano’s pit as thousands of fans in attendance – and a national television audience numbering in the millions – braced for an epic confrontation. With NASCAR officials in hot pursuit, Edwards climbed atop Logano’s pit box and shook hands with crew chief Todd Gordon, acknowledging one of the great, checkers-or-wreckers moments in the history of the sport with a smile and an unlikely wish of good luck. It was one last act sportsmanship, a farewell salute from a driver that has bettered his sport; both on and off the race track. That was the Carl Edwards we will miss. The Edwards who took time to interact – one on one – with little children, the elderly and the infirm. The Edwards who took his sunglasses off for television interviews, preferring to look straight into the camera when addressing his fans. The Edwards who media members knew as one of the most eloquent, insightful and honest interviews in the NASCAR garage. NASCAR chairman and CEO Brian France issued a statement saying that Edwards “has made an indelible mark on NASCAR. His hard-charging driving style has led to memorable moments that will live forever in the history of our sport. Carl's passion and personality will greatly be missed -- as will the signature backflips that NASCAR fans have come to expect following his victories. We wish Carl nothing but the best as he enters this next phase in life." That level of esteem – even more than the wins and championships – defines Edwards’ career. Edward’s decision makes perfect sense, and is based on the only thing that really matters. He is going home – healthy, happy and undamaged – to spend the rest of his life with his wife and children. It’s not complicated, convoluted or complex. Today’s announcement is the result of a simple man, refocusing on what is most important in his life. Chris Larsen and Stewart Friesen have announced the formation of Halmar Friesen Racing, which will run the full 2017 season in the NASCAR Camping World Truck Series, with Friesen as driver. Halmar International will serve as primary sponsor on the No. 52 Chevrolet Silverado. Managing the day-to-day operations of HFR will be NASCAR veteran Tommy Baldwin Jr.
Friesen, a native of Niagara-on-the-Lake Ontario, is a well decorated Modified and Sprint Car competitor. 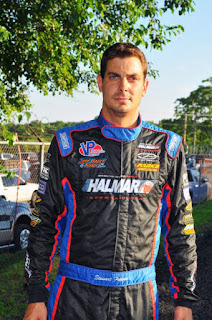 Making his NCWTS debut in 2016 at Eldora Speedway, Friesen ran a six-race schedule with a best finish of 13th at New Hampshire Motor Speedway. "I'm super excited to be part of the Halmar Friesen Racing team,"said Friesen. "We did a bit of racing last year to get our feet wet on asphalt, and we were pleased with our success. Everything we have going on with Tommy is exciting. It's great to have his experience guiding our team so we can hit the ground running in Daytona." Friesen's crew chief will be Trip Bruce, who most recently worked with Baldwin in the K&N Pro Series East. Throughout his career, Bruce has ten wins in the Truck Series. Larsen, owner of Halmar International, said of the new venture with Friesen, "We got our feet wet at Eldora last season mostly because we wanted to have some fun. After that, we ran several more races to get a sense of where we were. When an opportunity came to work with Tommy and it was a no brainer for us. Because of the relationship with Tommy we have committed to running the whole season. We know we will be prepared, we have good equipment and a great driver." Texas Motor Speedway will begin a major capital improvement project last week, consisting of a complete repave, construction of an extensive drainage system and a re-profiling of the 1.5-mile oval. The renovation will add a new layer of asphalt over the existing pavement, an expansive French drainage system on the frontstretch and backstretch, and reduce the banking in Turns 1 and 2 by four degrees. Barring extensive weather delays, the project is expected to be completed by early to mid-March in anticipation of the O'Reilly Auto Parts 500 NASCAR doubleheader scheduled for April 7-9. The repaving and drainage system come as a result of issues the facility was incurring in attempting to dry the racing surface, in particular this past year when both NASCAR race weekends and the INDYCAR race were affected by weather-related delays. 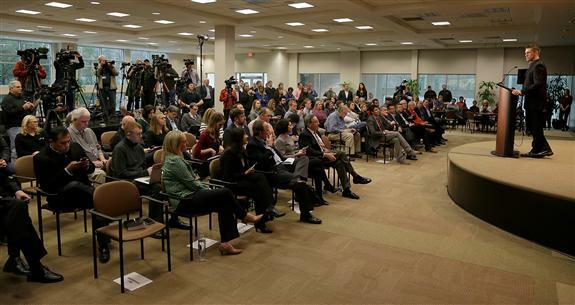 "The fans are why we are doing this," said Texas Motor Speedway President Eddie Gossage. "The old pavement no longer dried as quickly because through the years of use and weather, the asphalt became porous, kind of like a sponge. Even if we only had a brief shower it was taking us far too long to get the track dried in order to get on to the racing. We owe it to the fans to present the best possible race track so they will be assured of seeing NASCAR and INDYCAR races even if we face some brief inclement weather. This will accomplish that goal." Lane Construction Corp., of Justin, Texas, will handle the repaving project, after resurfacing several other speedways since 2003 including Charlotte Motor Speedway, Daytona International Speedway, Darlington Raceway and Talladega Superspeedway. 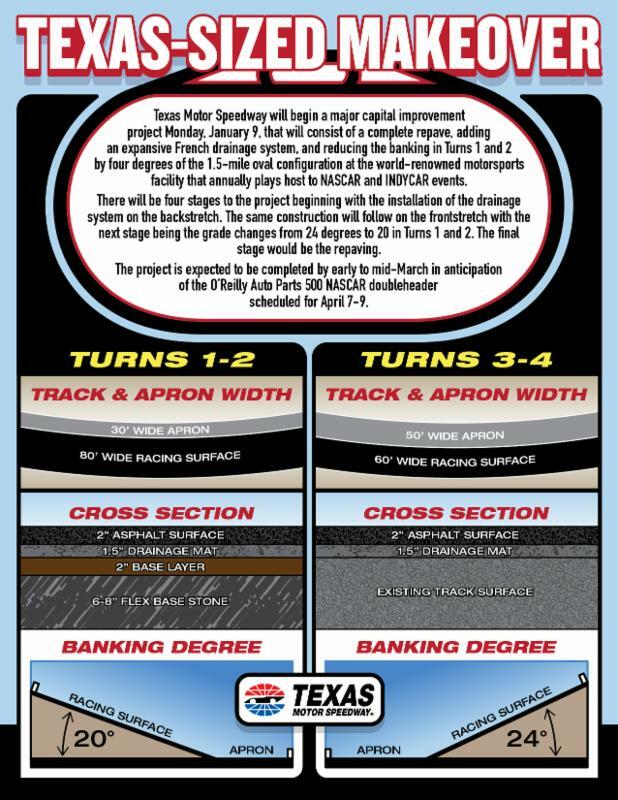 The repave will feature an asphalt mix similar to the surfaces at SMI sister tracks, Kentucky Speedway and Las Vegas Motor Speedway. The mix used in conjunction with the construction method will aid in the track's properties of an "aged" track. The NASCAR Hall of Fame has unveiled a third complete transformation of one of its signature exhibits, “Glory Road,” with a new theme—ICONS. The next generation of this exhibit opens to the public on Saturday, featuring a lineup of new vehicles that represent some of NASCAR's most recognizable race cars and drivers throughout the history of NASCAR. Encircling the Great Hall, Glory Road has served as one of the Hall’s most prominent focal points since opening in 2010, featuring 18 historic race cars from the beginning of NASCAR through present day. Current and historic speedways from across the country are illustrated here as well, where guests can touch the texture of various tracks and feel the intense banking that drivers face week-to-week. In preparation, the Hall closed its doors from Jan. 2 to 6 for installation of the exhibit. The changeover required extensive crane and rigging equipment to mount the cars on the surface of Glory Road, which gradually builds to the extreme 33-degree banking found at Talladega Superspeedway. Also in January, the NASCAR Hall of Fame will continue its limited-time special exhibit, “Smoke: A Tribute to Tony Stewart,” celebrating the end of an era when NASCAR driver Tony Stewart concluded his momentous career at the end of the 2016 season. The exhibit is located in the NASCAR Hall of Fame’s Great Hall and runs until Feb. 24, 2017, featuring 10 vehicles from different eras and racing disciplines narrating Stewart’s rise to NASCAR. Memorable Moments: This exhibit highlights history-making moments from the 2016 season. Hall of Honor: The Class of 2017 inductees as well as the Landmark Award for Outstanding Contributions to NASCAR recipient will be enshrined. Race Week: The Champions Case honors the champions from NASCAR's top three touring divisions from the previous year. The Squier-Hall Award for NASCAR Media Excellence recipient will be added to the media exhibit. Whelen Hall of Champions: The Whelen Everyday Champion exhibit celebrates a first responder who went above and beyond to protect and serve during the previous year. General admission tickets to the NASCAR Hall of Fame can be purchased by calling 877-231-2010 or at nascarhall.com. Admission is $19.95 for adults, $17.95 for seniors and military, $12.95 for children 5-12 and free for children younger than 5. Memberships are available starting at $125. For more details, visit nascarhall.com. Updates are available at facebook.com/nascarhall or by following @NASCARHall on Twitter. 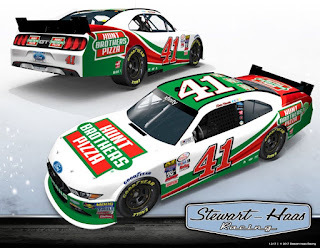 Hunt Brothers Pizza will expand its partnership with Stewart-Haas Racing to include a four-race sponsorship of Kevin Harvick in the NASCAR XFINITY Series. Hunt Brothers Pizza has been involved with SHR since 2014, serving as an associate sponsor of Harvick and the No. 4 Monster Energy NASCAR Cup Series team while also being the official pizza of SHR. As SHR expands into the XFINITY Series for the first time in 2017, Hunt Brothers Pizza will be the primary sponsor of Harvick’s No. 41 Ford Mustang April 8 at Texas Motor Speedway in Fort Worth, May 27 at Charlotte (N.C.) Motor Speedway, July 7 at Kentucky Speedway in Sparta and Sept. 2 at Darlington (S.C.) Raceway. Hunt Brothers Pizza will also serve as an associate sponsor of SHR’s No. 00 Ford Mustang driven by XFINITY Series rookie-of-the-year contender, Cole Custer. Prior to winning the 2014 NASCAR Cup Series championship, Harvick won two XFINITY Series titles in 2001 and 2006. The 41-year-old from Bakersfield, California, has 46 XFINITY Series wins to augment his 35 NASCAR Cup Series victories. Veteran Michael McDowell will return to Leavine Family Racing for the full 2017 Monster Energy NASCAR Cup Series season. McDowell will once again pilot the No. 95 Chevrolet SS as the primary driver for LFR in all 36 races, making the team Chase eligible for the first time since its inception in 2011. LFR will also welcome back championship-winning crew chief Todd Parrott this season. Parrott took over the post in October of last season and led the No. 95 to earn six Top-25 finishes in the final seven races of the campaign. McDowell, who is entering his 10th year competing in NASCAR, earned his first NASCAR national touring series win last year at Road America in the XFINITY Series and recorded 16 Top-25 finishes with LFR in 2016. 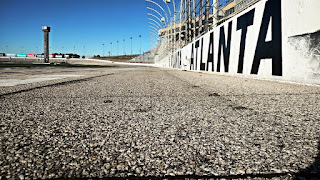 Twenty years after it was last resurfaced, Atlanta Motor Speedway’s historic racing surface will be repaved this spring, following the March 3-5 NASCAR Weekend triple-header. Work is scheduled to begin in late March with an expected completion in mid-April. The current asphalt at AMS is the second-oldest on the entire Monster Energy NASCAR Cup Series circuit, and officials credit its longevity to a combination of the mild Georgia winters and a meticulous maintenance program over its two-decade lifetime. Despite the wear and tear of aging in recent years, the track has been a favorite of many competitors who have raved about the challenging nature of the track. Its aged surface, slick driving conditions and multiple racing grooves have produced exciting races and close finishes for fans, as well as a technical challenge for drivers who have battled slick corners, fast straightaways and ample opportunity for passing. Some of the most notable NASCAR races have taken place on the current surface, including Dale Earnhardt’s 0.010-second margin of victory over Bobby Labonte in 2000, Kevin Harvick’s emotional and record-setting 0.006-second margin of victory over Jeff Gordon in Earnhardt’s Richard Childress Racing car the following year, Carl Edwards’ first Cup Series victory in 2005 and subsequent season sweep of both Atlanta races that year and the first-ever Atlanta night race in 2009. Geoff Bodine’s amazing AMS qualifying record was set at the very first race on the current surface in 1997, when he blazed around the track in 28.074 seconds at an average speed of 197.478 mph. Currently, Bobby Labonte and seven-time NASCAR champion Jimmie Johnson are tied at five for the most Cup Series victories on the surface. Johnson can break the tie in the final race on the surface at the 2017 Folds of Honor QuikTrip 500 as he attempts his third consecutive victory at Atlanta. The repaving project calls for a brand-new asphalt surface to be lain over top of the current surface. AMS’s quad-oval layout and 24-degree banking in the turns will remain unchanged. 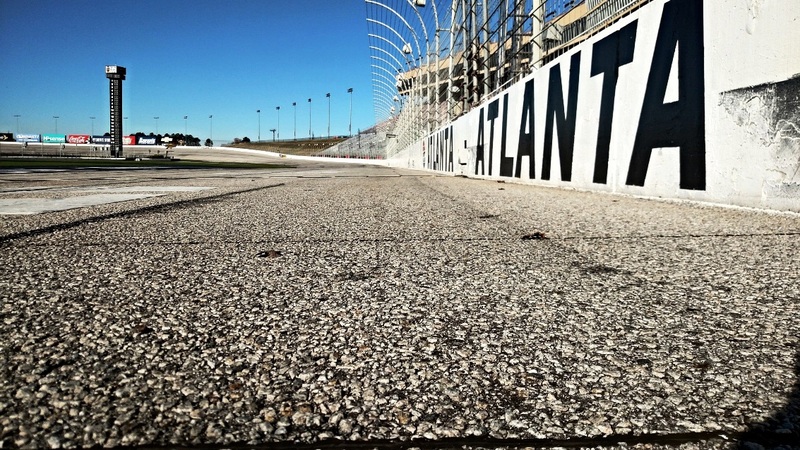 While a smoother surface and blended seams will accompany the new repave, the high speeds and multiple racing grooves unique to Atlanta Motor Speedway are expected to endure and produce the same, thrilling racing experience for both fans and drivers for many years to come. Drivers who have enjoyed the unique quality of the existing AMS racing surface will have one more opportunity to etch their name in the track record books when NASCAR returns March 3-5. NASCAR Cup Series qualifying will kick off the weekend on Friday, March 3 before the only same-day doubleheader will take to the track on Saturday, March 4 with the back-to-back Rinnai 250 XFINITY Series and Active Pest Control 200 Camping World Truck Series races. The Folds of Honor QuikTrip 500 Monster Energy NASCAR Cup Series race will round out the weekend on Sunday, March 5 with a scheduled 2:30 p.m. green flag.